Raven's Dashboard gives you an ultra-customizable, at-a-glance view of all of the Internet marketing data that is most important to you. Whether it's a table of keywords from Keyword Rankings, a graph from Google Analytics, or the singular metric that you care the most about from Research Central — that's all available through the Dashboard. 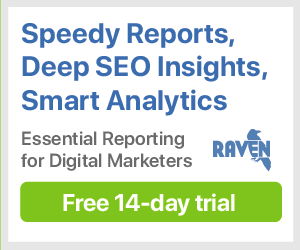 Every single one of Raven's more than 300 metrics can be added to your Dashboard, from tools as diverse as Google Analytics, Link Manager, Site Auditor and Facebook. Just add a Section or a Custom Widget to your Dashboard to see that data whenever you log into your Raven account. Each of the Sections and Widgets in your Dashboard can be dragged and dropped into whatever configuration you'd like, allowing you to organize these modules on the fly to create your perfect dashboard. Don't care that much about Twitter? Throw it on the bottom! Want to reorganize your widgets in a section from more important to least? Drag your modules and drop them in place. We'll save your progress as you go. Have you constructed the ultimate Dashboard for your Campaigns? Don't recreate it for all of your other Campaigns — just import it! Dashboards can be imported between Campaigns, saving you valuable time and energy. Even better, make that Dashboard available to all of your users — read-only and sub-users alike.